For the furniture shopper who craves both an elegant look and incredible, supportive comfort, look no further than this superb reclining sofa. Subtly rolled arms and a winged back design add a polished, transitional appeal to your room decor. 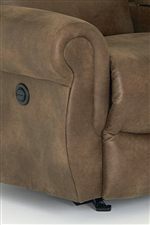 Plush bustle back cushions with extra lumbar support and a thick, chaise leg rest set you up for resilient support. This reclining sofa is specially designed to nestle closer to the wall with no fear of damaging your paint job when you recline. Sofa available with manual or power recline. The Terrill Transitional Space Saver Reclining Sofa by Best Home Furnishings at Best Home Furnishings in the St. Louis, Chesterfield, St. Charles, MO & Waterloo, Belleville, Edwardsville, IL area. Product availability may vary. Contact us for the most current availability on this product. Recliner Mechanism All-steel encased ball bearings with engineered lubricants work together with revolutionary "long glide" design for smooth, comfortable action. The Terrill collection is made up of casually classic pieces, adding traditional rolled arms to the soft and supportive bustle back sofa for a timeless and polished look. 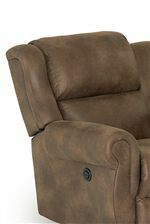 Each of these pieces is equipped for gentle reclining motion, with the option of rocking recline, swivel recline, or space-saving wall recliners depending on the function you have in mind. For a relaxed take on traditional style, the Terrill collection is the perfect choice for you. The Terrill collection is a great option if you are looking for Transitional furniture in the St. Louis, Chesterfield, St. Charles, MO & Waterloo, Belleville, Edwardsville, IL area. Browse other items in the Terrill collection from Best Home Furnishings in the St. Louis, Chesterfield, St. Charles, MO & Waterloo, Belleville, Edwardsville, IL area. 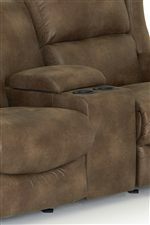 Power Space Saver Reclining Loveseat w/ Con.